This post contains some affiliate links. If you click on these links and buy something, I make a commission at no cost to you. Hi friends, and welcome to my three-part series on a complete guide on creating interior spaces. I am joining four other bloggers who are sharing their guides as well, and have linked to their guides at the end of this post. You’ll want to head over to check them out; they’re full of invaluable information. One of the most common questions we get is, “Where do I start when updating/creating a space I love in our home?” Or, “I know what I want, but when I get to the store, I feel so lost.” We’re tackling the answers to these questions and more, hoping that over the next few weeks you will feel confident in your ability to create interior spaces with ease. About two years ago, I launched She Gave It A Go and began building practices that helped me nail down where to start when creating a space in our home. Inspiration is your launching pad! 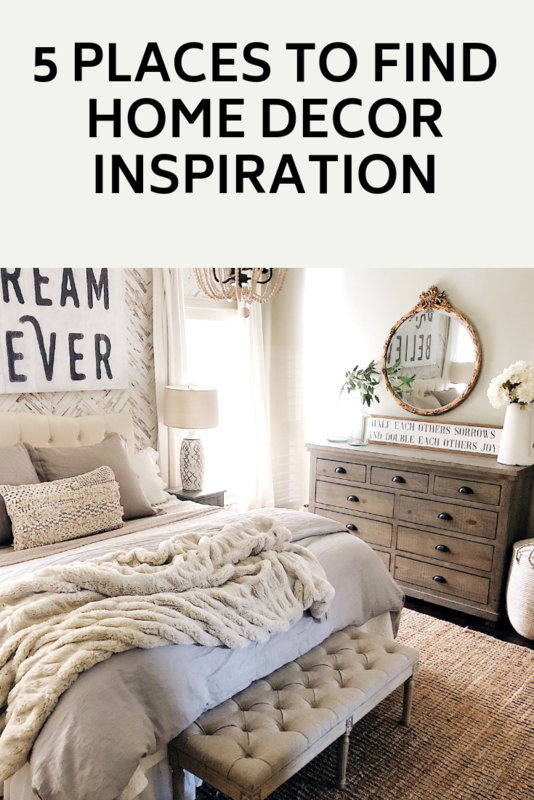 Most recently, I have been inspired to makeover our bedroom, my son’s bedroom, and our living room through various DIYs, seasonal decor changes, and new pieces that have been placed to update the spaces. In this series, I will be using our master bedroom as the example on a complete guide to creating spaces. I invite you to choose an area in your home that you can envision too when walking with us through this series. It helps to “practice” these steps visually in your mind, helping boost your confidence all the more on doing this yourself. As I mentioned, I will be using our master bedroom as my example in this series. I have had the opportunity to create several different looks in our bedroom over the past year. Whether it be a seasonal update, new bedding, adding new furniture or creating an accent wall, it provides an example of how these five sources have acted as inspiration for me when creating our master bedroom. Before we move forward, let me just say that the goal is to create a space you love and enjoy. You may or may not make changes as often as I do; it’s up to you whether you want to create a space that will remain unchanged for a while, or one that changes with the seasons. Let’s get started! Below are five sources of inspiration when creating interior spaces of your home. Seasonal inspiration is the easiest source to me. Isn’t it always so fun walking into a store during Christmas or Easter, and all of the sudden you see items that are representative of the season? Seasonal decor is easy to come by when it is a big holiday. As you glance around the store or maybe you are looking at the store online, what immediately makes you smile? What pieces make your heart feel excited? These pieces are your inspiration pieces! I shared an example of how I did this in the fall with our bedroom here. I also shared how these winter home decor pieces can inspire you after your Christmas decor comes down here. This is like the mecca of all inspiration, right?! This interior decorating resource can be an incredible source for inspiration but also overwhelming. I encourage you to use the search bar to filter images that you are going for. For example, are you looking to create a space that is representative of modern farmhouse style? If so, you may type in “modern farmhouse decor” or “how to get the farmhouse style look”. There are several pins that are called “design boards” where they’ve already gathered some inspiration for your space. You can also search the specific space you’re wanting to design (i.e., “bedroom,” “living room”) and as you are scrolling, pin those images that stop you in your tracks! After while, go back over those inspirational pins and nail down the “look” that most represents your goals. This is your inspiration. You can check out my Pinterest page here, I’d love to have you follow along! When you think inspiration piece, it may sound repetitious, but this is what your entire space is built around. What does that mean? Have you recently bought 2 throw pillows from your favorite home decor store and want to use them as your spring board for your space? Maybe you bought an art piece at a recent show that really spoke to you; this could be your inspiration piece. Or, it could be a few pieces that are cohesive in nature. 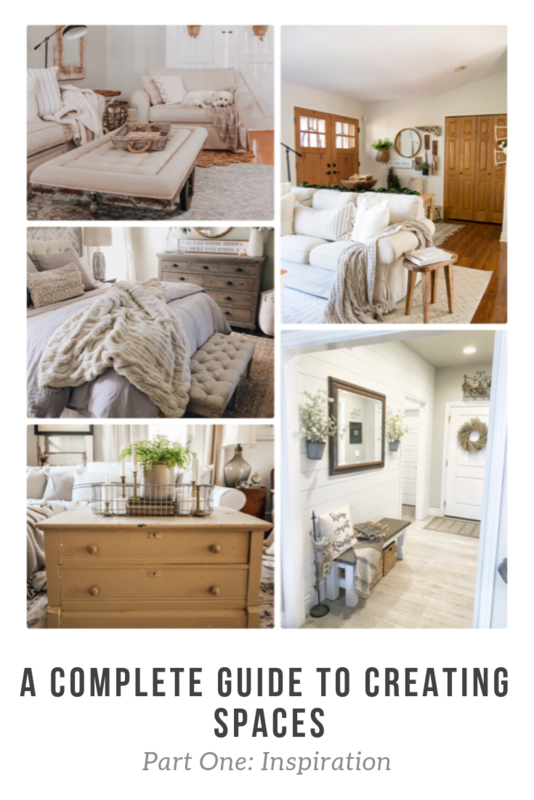 Check out this post where I had five pieces help me create a cozy bedroom space and this one here that talk about five bed basics you don’t want to miss out on and how they inspired a space refresh in our bedroom. Yes, I still flip through books and magazines for inspiration! There are countless books and magazines out there with interior decor inspiration. My favorite way to utilize this resource is heading to a book store, grabbing books/magazines that jump out at you and look through the pages while implementing similar practices to the ones I suggested with Pinterest. This is a resource that I have come to enjoy more of over the past couple of years. Trending decor is a fun way to open the door to new and exciting ways to be inspired. Simply google the year it is + home decor trends to check out what is trending for the year. You will come across a multitude of inspiration you may not have found in these other methods. For example, when I was utilizing this as a resource recently, I discovered that bold patterns was a trend for 2019. It inspired me to choose the lamps that are on our bedside tables in our bedroom. Although I wouldn’t have searched for bold patterns, coming across this trend inspired me to add an element of this in our bedroom. And, I am enjoying them. Interested in what’s trending this spring? I shared my favorite spring trends for this year here. I am excited for you to tap into these resources and how they will be the launching pad to create spaces that you will be thrilled about! Now, I encourage you to head over to each of these dear friends for the rest of Part 1 of the series. You are sure to walk away with tons of tips and encouragement regarding inspiration! Part 2 of a complete guide to creating spaces in your home can be found here. I would love for you to stay in touch by subscribing to my weekly newsletter! Get weekly tips, encouragement, special deals, and more! Sign up HERE and receive a free DIY Guide for making any table the perfect chippy paint table.